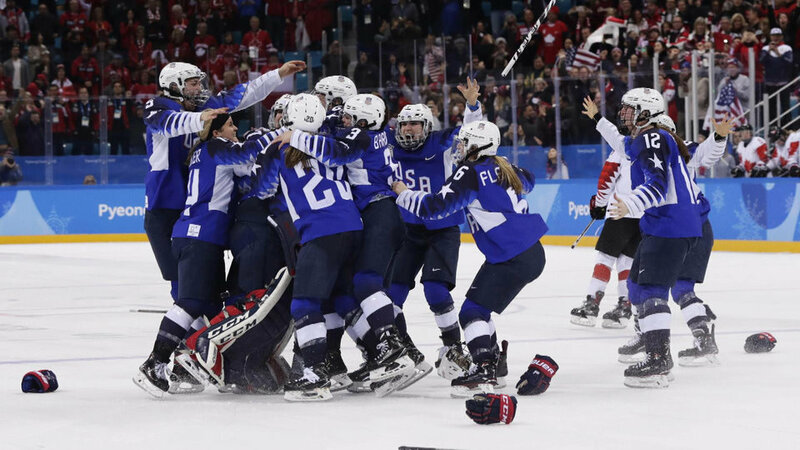 The U.S. women's hockey team won its first gold medal since the inaugural women's tournament at the 1998 Nagano Games, and plenty of people stayed up late to watch the game. Jim Craig, a member of the 1980 "Miracle on Ice" U.S. men's hockey team that upset the Soviet Union for Olympic gold in 1980, was also tuning in. Pittsburgh Penguin star Phil Kessel gave the U.S. women a shoutout as well. His sister Amanda scored the second goal in the shootout. And some American NHL players — who would have been at the Olympics if the league had allowed them to go — paid their respects, including 2014 shootout hero T.J. Oshie. Goalie Maddie Rooney, one of the heroes of the shootout, got some love from fellow Team USA goalie, soccer's Hope Solo, as well as from a Wikipedia editor. Actress and non-professional athlete Olivia Munn was 11 emojis happy. Steph Curry took a break from basketball to cheer on Team USA. Fellow Team USA Olympians Alexa Scimeca Knierim and Chris Knierim (pairs figure skaters) were at the game. Bronze medal ice dancer Alex Shibutani couldn't contain his emotions, and U.S. silver medal speedskater John-Henry Kreuger was PUMPED. So so so ridiculously overjoyed for them!!! They’re such good friends, amazing teammates, and great ambassadors for their sport, and @TeamUSA. So proud of them. And not just because they won this game. These girls are champions, win or lose... gold or silver. Team Canada didn't escape notice. Super fan Scott Muir, the gold medal-winning ice dancer, was seen yelling at the referees during the game. And a disappointed Canadian player removed her silver medal right after it was placed around her neck, sparking its own controversy. Of course, the American players themselves took to Twitter to share their joy. Things wouldn't be complete without a Hilary Knight selfie.